It’s as if we’ve all been unconsciously waiting with our breaths held, and the arrival this week of more temperate weather has allowed us to finally exhale, open the windows to let in the air, and stretch towards the springtime sun. The trees responded immediately to the change by quickly uncurling their leafy tips, the new foliage forming a lacy pattern in the bordering woods. Across the neighborhood the hum of lawn mowers could be heard, everyone rushing to catch up after what seemed like endless days of rain. 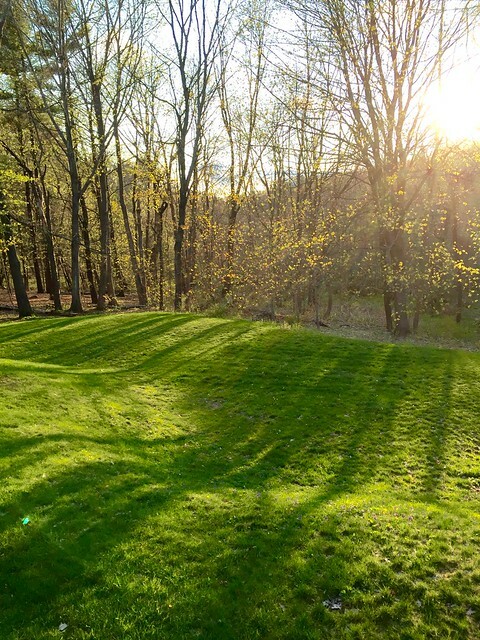 I could swear that my own grassy patch sprouted at least another inch between the morning’s shearing and day’s end. Happy indeed! Looking forward to what the new season will bring!